Whether your cooker hood is faulty or your hob won’t heat, we’re ready to help sort out your problem. We repair all types of hoods/hobs including integrated and extractor hoods along with gas, electric, induction and ceramic hobs. We can arrange for one of our repair experts to visit on most days of the week, on a convenient day for you. They’ll call 30 minutes before they arrive so you’re not stuck in waiting if you need to pop out quickly. The fixed fee includes all the call out, labour and charges for parts, and it’s all on a "no fix, no fee" basis. That means if we can’t fix the fault, or we find that it’s beyond economical repair*, we’ll give you a full refund. 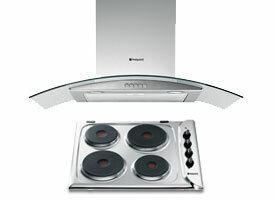 Our hood and hob repairs come with a 12 month guarantee that covers you for the fault we repair.